As a workaround for the noisy 3.3V ADC of STM32 and LPC17, I developed a new solution with an external ADC. I selected the MCP3208, since it's available for only 2.75 EUR at Reichelt. It offers a resolution of 12bit. The ADC is accessed via SPI (e.g. J19 of the MBHP_CORE_LPC17 module). A 74HC595 has been added and is accessed via SPI as well, so that no additional IO pins of the microcontroller have to be sacrificed for the MUX control. 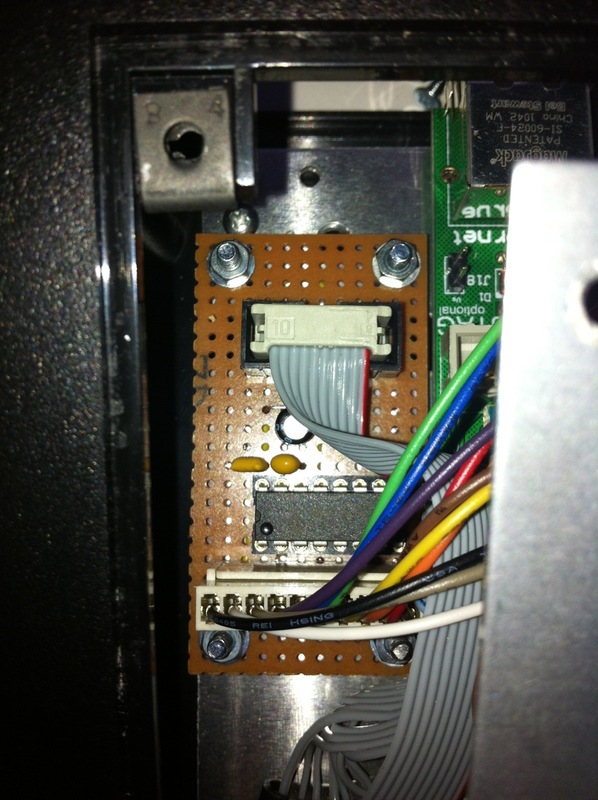 By using a nice trick, only a single chip select line is required to access both serial devices. This makes the solution scalable: multiple MBHP_AINSER64 modules can be accessed from a single core. The driver is prepared for 2 modules (= 128 pots), but scanning even more pots is no problem as long as dedicated uC outputs for chip selects are available. For comparison: the ADCs of STM32 and LPC17 are jittering by +/- 16, which means that even if the conversion result is converted to 7bit resolution there is a risk for unstable values. If the module is externally powered, the jitter is +/- 1 LSB! First I tried it with Kicad, but quickly changed back to Eagle since I don't like the schematic entry - it slows down the process too much. it looks as if spacing might be a little tight for Reichelt WSL type headers - have you checked that they fit? I would definitely prefer them over regular simple headers just because it is easier to get the cabling right again in case one ever has to remove cables. Thanks for the important tip! The headers are too close together, I will fix this after christmas. Is anybody interested to join the prototype order? I haven't read the thread twice yet, but a couple of questions. I have a lpc core and the mcu at my desk now, but I ain't gonna do much about it for the next six months though, but my plan for the lpc was to build a cs for my daw, atm cubase. Does this design replace the regular ain? And will this be the way to go for future projects like the one I mentioned above? Will it be compatible for a long time like the other ain design has been? Yes, but only for MIOS32 based cores. Meanwhile I think it would be better if I just order two cheap prototype boards at Olimex. Count me in - I need high definition ADCs. Could you upload the eagle layout file? I got the prototype PCBs and successfully tested the module today! looks like you tried Laen's PCB service - nice color on the board :thumbsup: ! I connected CH0 of the MCP3208 to Pin 3 of the 4051, and CH1-7 to ground. Then I noticed in the AINSER64 schematic that CH0 is actually connected to the last one of the 4051s (IC11 / J13), not the first one. Does this matter at all? Or is it better to use CH7 with a single 4051 setup? 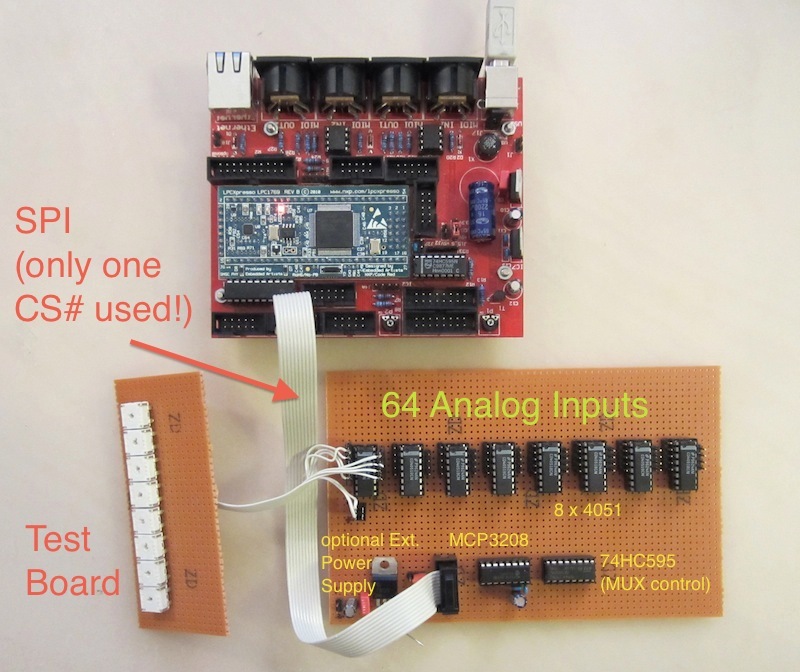 But please note: you don't need a 4051 multiplexer if only 8 channels are required. You even don't need a 74HC595 for this minimal solution. Instead you would only need the MCP3208, pots can be directly connected to the 8 ADC inputs! + J2, R1, C4, C5, C6 - done! 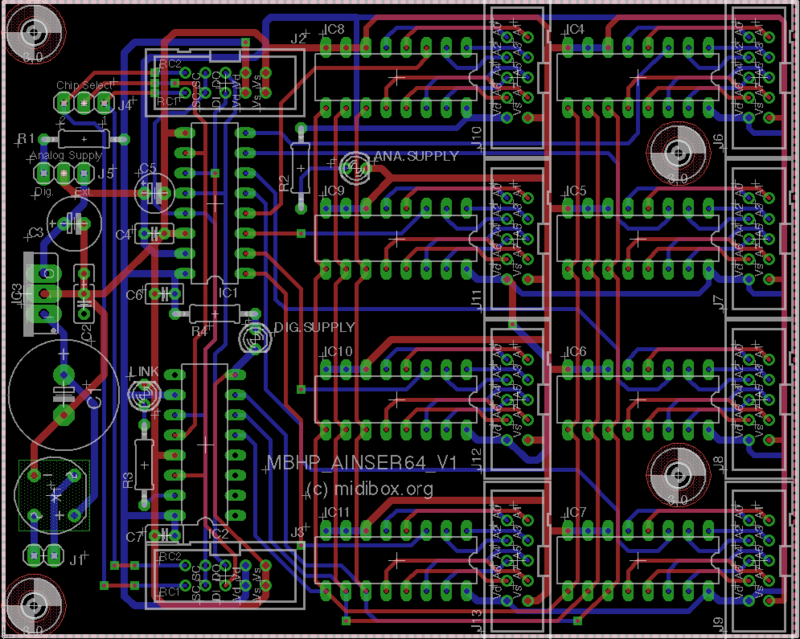 Normally it's faster to build such a circuit on verboard instead of doing the timeconsuming layout + etching. I thought it way too complicated. Thanks, you just saved me a lot of work. Will report back when I finished the breadboard. I built my small "Ainser8" on breadboard today and it all works perfectly! At first I wondered why a single pot would send 8 values at a time, but then I figured out that I had to disable all the pins which were on by default. btw I bought my MCP3208 from Segor, and they have two different versions (C and B, which has slightly better specs) of the chip. In the store I was unsure what to buy so I just got the B version to be on the safe side, but maybe that's not necessary at all. Is there any word about when Smash will have these boards available?